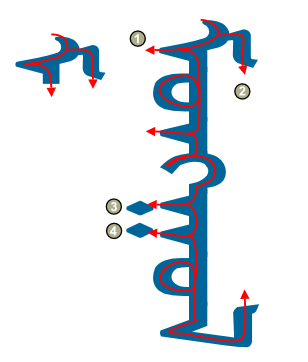 The Uighur script is cursive, therefore it is possible that each letter has as many as three different shapes depending on whether the letter appears in an initial, medial, or final position. If you have studied Arabic or any of those languages which use the Arabic script then you will be familiar with this system. If not, there is no need to worry, these things are, after all, just alphabets like our own more familiar Roman set. It might help if you think of the difference between printed English and the joined-up handwriting you learned in your schooldays. Even here there is some kind of general system for how to join the individual letters, and consequently slightly differing forms for each letter depending on its position in a word. 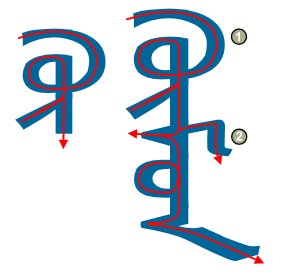 The difference with Mongolian is that there is a far more rigid system governing how letters are connected, and some undergo radical changes in different positions. Lets look at some examples. Probably the first word which every budding Mongolist will learn to write is Khan, which is spelled in Uighur as q-a-γ-a-n. Looking back at the alphabet table, you will see that for this word you need an initial ‘q’ (letter no. 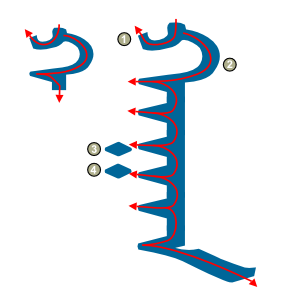 8), a medial ‘a’ (letter no. 1), a medial ‘γ’ (letter no. 9 – the one with the two dots), another medial ‘a’ (letter no. 1) and a final ‘n’ (letter no. 6). You may have noticed that there are two forms for a medial ‘γ’ one with two dots and one without. Don’t let this bother you too much, all you have to remember is that the one with the two dots is used when ‘γ’ is followed by a vowel (as is the case with q-a-γ-a-n) and the other one is used when ‘γ’ is followed by a consonant. Don’t worry too much about the other double letters in the alphabet table as these will all be explained in due course. 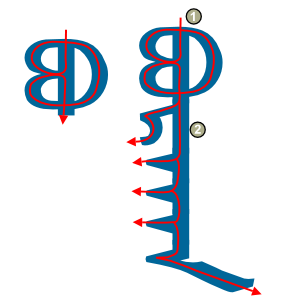 All Mongolian words are based around single straight line which the Mongols call the spine (Mong. niγurun). 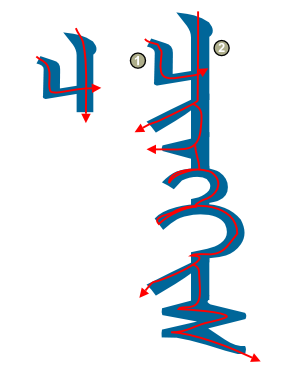 All individual letters are then represented by flicks and dashes away from this central line. In acquiring good handwriting it is important to try and keep the spine as straight as possible. You should be able to complete the main body of any Mongolian word without the pen leaving the paper. The numbers above represent the order of the strokes you should use. After you complete stroke 1, you should complete stroke 2 right down to the bottom in one continuous line, and only then should you return to add the dots on the ‘γ’. Generally speaking, the spine and any flicks to the left should be written first, flicks to the right and any dots/dashes are added afterwards. Keeping to this order of writing will help you in gaining legible Mongolian handwriting. Now let’s look at another important word, this time the word for Mongol. Which is spelled m-o-ng-γ-o-l. There we are, you now know how to write three very important words which crop up all the time in ‘Mongolistics’. You will see these words regularly, in books on Mongolia, the Internet and of course in Mongolia iteself! Look at the middle of the title/menu bar for this page, you should be able to recognise one of the Mongolian words there, in a slightly more informal script style, can you read it? Now let’s learn some words containing more complex letters. The first one is the word for man, or person, which is spelled kü-m-ü-n. Watch out though, the letter k has a number of different forms depending on which vowel comes after it. So in this case we need to find the form for ‘k’ + ‘ü’. Click here to take a look at the ‘k’ variations table. What you should see is that there is a special form for kü. However in the end, this is basically just a combination of initial ‘k’ (letter no. 20) and medial ‘ü’ (letter no. 4 – the second option; which is always used when ‘ü’ or ‘ö’ appear in the first syllable of the word as is the case here). The only reason why it is written with the modified form is that is looks much nicer and less clumsy. The letter ‘b’, like ‘k’ in the previous example, also has a number of special forms depending on which vowel comes next. Please download the Mongolian script pdf from the top of this page to see these variant forms. The next word I have chosen is one which you will meet very often, Buddha, which is spelled b-u-r-q-a-n.